This post continues the roundup “Designing Effective Websites – 80 Articles of Summer 2011″ and presents articles retweeted at @htmlcut this autumn. 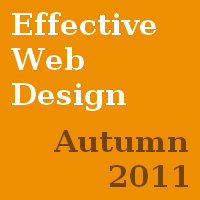 Autumn 2011 was very rich in great web design articles and inspiration collections, so we have decided to gather as many as possible of them. As usual, you’ll find a lot of interesting information on web design principles, usability and user experience, content writing, designing e-commerce websites and effective call-to-action, and many other questions. This time there is a great deal of articles on development for mobile devices, responsive web design, as well as on redesign techniques and cross-cultural websites. One more novelty is that we’ve added several controversial articles, in particular, about HTML semantics. Hope you’ll enjoy this roundup. Please note: Most of the articles contain lists of useful additional resources. Don’t forget to check them out too. 4). How Clean is Your Web Design? 12). Why is Design the Body Language of the Web? 2). Fixed vs. Fluid vs. Elastic Layout: What’s The Right One For You? by Sacha Greif (@SachaGreif): “Unsolicited redesigns are when a designer takes it upon themselves to redesign a site for free without having been asked by the company. I recently did a quick Quora redesign myself, and it prompted me to explore this topic.” ALSO DON’T forget to follow the articles mentioned there. 6). Readability: Who Are You Writing For? 7). How to Use Images Effectively in E-Commerce Websites? 5). 11 reasons why Responsive Design isn’t that cool! 1). Accessibility: What’s Your Markup Saying to You? 1). Cross-Browser PSD to HTML Conversion – How Compatible Should It Be With the Advent of Mobile Web? by Jake Rocheleau (@jakerocheleau): “30 amazing examples of new web interfaces and how you can jump ahead of the curve in your own designs.” Some are REALLY impressive. 8). Flash Isn’t Dead Yet! 11). Mobile apps must die! by admin (@vitamintalent) …and some interesting predictions. by Jake Rocheleau (@jakerocheleau) – One of the best 404 page collections. Thank you for good site. Very helpful.